Charlotte of Savoy came from a large family and was married at the tender age of nine under difficult circumstances. Her husband, the Dauphin Louis of France was twenty-eight at the time of the wedding and they would not consummate the marriage until Charlotte was sixteen. When she became Queen of France, she would lead a lonely and isolated existence. The exact date of Charlotte’s birth is unknown but based on historical records, it is believed to have been in November of 1441. She was the second daughter of Louis I the Duke of Savoy and Prince of Piedmont and Anne of Cyprus. She was one of nineteen children, fourteen of whom survived infancy. She most likely received an education worthy of her rank. Under an agreement signed at Lausanne on March 11, 1443, Charlotte was betrothed to Frederick, Duke of Saxony, the son of Frederick II Elector of Saxony. For unknown reasons this betrothal was abandoned. The Dauphin Louis, son of King Charles VII of France had been married to Margaret Stewart of Scotland in 1436 when they were both teenagers. Louis was sent on a series of successful campaigns against the English and the Swiss and had taken his place on the king’s council. He was planning more campaigns when his father recalled him to court where he was isolated and withdrawn. His unhappy marriage to Margaret ended when she died unexpectedly and childless in August of 1445. Until the end of 1446, Louis kept a low profile until he emerged plotting and scheming, looking for support and some kind of employment. He finally received permission from his father to go to the Dauphiné to receive homage and further French interests in northern Italy. The Dauphiné was a jumble of feudal and episcopal entities. Louis went to work immediately organizing and consolidating these entities, creating a central government and doubling the size of his little state. He was delighted to be away from the control of his father and lived the high life, taking mistresses and doing as he pleased, creating a following. By 1450, he had done all he could in the Dauphiné and was looking to marry again. The Duke of Savoy was an ally of the Dauphin. Louis was twenty-seven, unmarried and childless when the heir to the French throne should have had a family and a successor. Louis requested permission from his father several times to marry the Duke of Savoy’s daughter Charlotte and was denied every time. In February of 1451, Louis had received another refusal for permission. In the meantime he sent an embassy to Savoy and a marriage contract was signed around the same time. Louis gave his two representatives five thousand crowns each for their services and the Chancellor of Savoy received ten thousand gold crowns for his part in the agreement. The legal age in the Catholic Church at the time for a woman to marry was twelve and Charlotte was most likely nine. 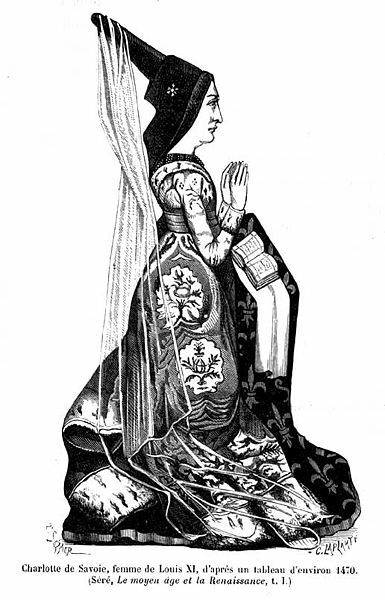 Louis and Charlotte celebrated their nuptials on March 9, 1451 in Chambéry. When King Charles heard the news of the marriage contract being finalized, he sent a herald to stop the wedding. The herald arrived just in time to witness the couple enter the chapel in crimson velvet robes. After the wedding, Louis returned to the Dauphiné and Charlotte soon followed him. In honor of her joyous arrival, several towns gave gifts of money to Louis. She entered Louis’ household to live until she was old enough to consummate the marriage. Louis and his father argued off and on over the marriage and other political matters until in August of 1456, King Charles sent an army to the Dauphiné to try to force Louis into submission. Rather than meet his father in battle, Louis escaped to Burgundy where he lived as the guest of Philip the Good, Duke of Burgundy. Charlotte was left behind. At the urging of the Duke of Burgundy, Louis sent for Charlotte in the spring of 1457. She traveled to Namur where Louis met her. There was no official greeting. The couple slept together for the first time that night. Charlotte wasn’t physically attractive but she wanted to do everything she could to meet Louis’ will. Louis was satisfied with her and for the first twelve years of the marriage, he remained relatively faithful to her with just a few amours on the side. Charlotte’s first four children were born in Burgundy. A son Louis was born in 1458 and lived until 1460. Joachim, born in 1459, died shortly after birth as did Louise in 1460. A daughter Anne was born on April 3, 1461, just before Louis became king. She would marry Peter II, Duke of Bourbon and would serve as regent of France for her young brother Charles when he became king upon their father’s death. On July 17, 1461, Louis received word that his father was dying. He made a hasty retreat from Burgundy to Paris to claim his crown, without saying goodbye to the Duke and Duchess of Burgundy. Charlotte was left behind at their temporary home in Genappe and Louis instructed her to borrow whatever carts she could find from Isabella, the Countess of Charolais who lived nearby in Quesnoy. Isabella sent her equerry with carts, carriages and wagons. Charlotte packed up and also left without saying goodbye or thanks to the Duke, Duchess or Countess. King Charles VII died on July 22, 1461 and Louis and Charlotte became King and Queen of France. Louis was preoccupied with the affairs of his kingdom and didn’t really hold court like other comparable monarchs. Charlotte played no political role in her husband’s administration. Louis kept her in isolation in the Château of Amboise on the Loire in an effort to keep her and her servants away from court intrigue. As Queen, Charlotte had four more children. Jeanne was born on April 23, 1464 and would live until 1505. She was briefly Queen of France as the first wife of King Louis XII. On December 4, 1466, Charlotte gave birth to a baby boy, who was baptized quickly and named Francois. He died shortly thereafter. Charlotte’s grief was great as this would have been the much wanted heir. Finally on June 30, 1470, Charlotte gave birth to the future King Charles VIII. Another boy named Francis was born in 1472 but he only lived until he was three months short of his first birthday. A chronicler stated that after the death of this child, Louis swore he would be faithful to Charlotte from then on. The chronicler Phillip de Commynes confirms he kept this vow. Charlotte’s life at Amboise was monotonous and secluded. She was surrounded by her children, her servants and several of her sisters. She spent her time playing chess and marbles, listening to her lute player, doing needlework and following devotional pursuits. Phillip de Commynes described Charlotte saying she “was not one of those women in whom a man would take great pleasure but in all a very good lady.” A diarist from a Bohemian embassy in 1466 described the Queen: “verily it was a pity she was but a middling handsome woman”. Despite this she was virtuous and considered very stylish by the French court. While Louis was in charge of the education of their son Charles, Charlotte supervised her daughters’ education. 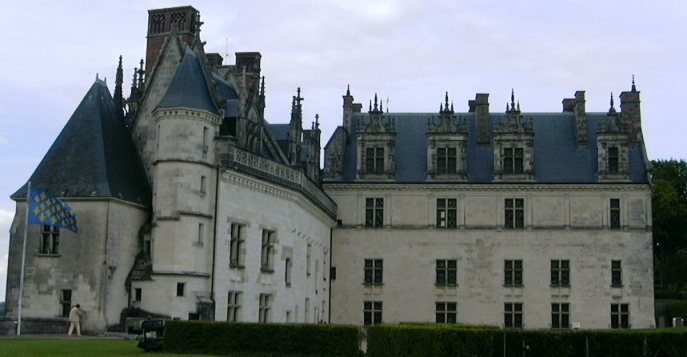 Louis would visit Charlotte at Amboise where he enjoyed the hunting and the rustic atmosphere of the castle. On June 8, 1470, Louis had a meeting with the powerful Earl of Warwick and the Duke of Clarence from England. They were taken to Amboise and greeted by the heavily pregnant Queen. She received kisses from them both. Charlotte was an avid reader and acquired many books. She had a splendid library in her home. Louis did not always fund her household to the fullest so she couldn’t print her own books but she managed to keep a bookseller at all times. Upon her death her collection consisted of about one hundred manuscripts, mostly devotional works. Her library would become the genesis of the Bibliothèque nationale of France. Louis died on August 30, 1483. Charlotte followed him in death on the first of December that same year. 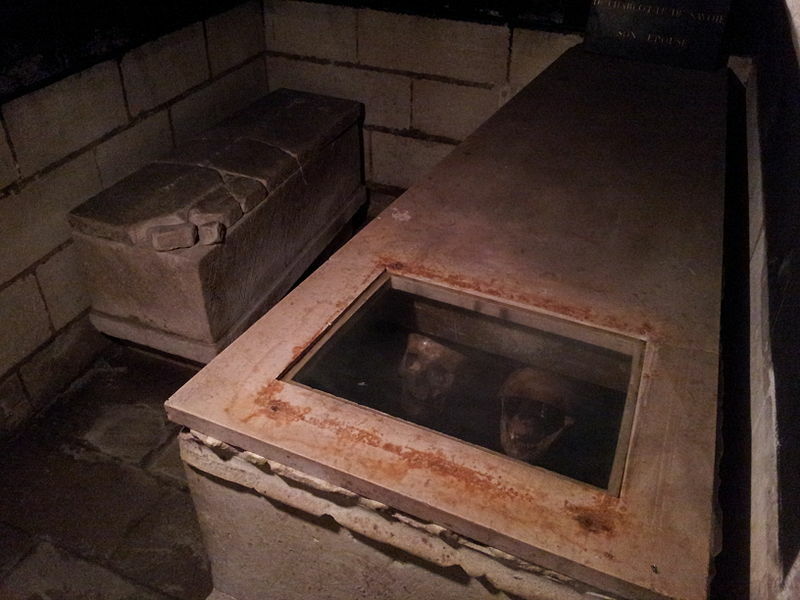 They were both buried in the Notre-Dame de Clery Basilica in Clery-Saint-André. Charlotte was devoted to her husband all her life. It is interesting that the “Spider King” and his consort were not buried in the Basilica de Saint-Denis, the necropolis of the Capetiens and the cadet lines of Valois and Bourbon? The Basilica of Our Lady of Cléry-Saint-André was a favorite spot of King Louis XI. He never did like to follow tradition! I replied via Facebook. But I don’t see my comment here. The picture with the skulls is kind of odd. When, who and why would the skulls be positioned like that? It would be a rather awkward position to be buried in to have it occur naturally. Hi Russell, It is a macabre picture isn’t it? I’m not sure the graves went undisturbed over the centuries so it’s possible the skulls were moved at some point. You’re welcome kathy. Thanks for reading! Hello Susan, what a wonderfull article. Since our re-enactment group portrays both Louis and Charlotte (when they still were prince and princess) we were VERY interested in this article and the beautifull pictures. We have put a link to your page on our website http://www.brabantboven.be (if not allowed we will remove it) as a reference for our characters. Thank you Raf and thank you for posting the link. What a wonderful website and very interesting group. Thanks Jo. I was wondering if anyone would notice the skulls! I think Charlotte had a relatively happy life. Her position was greatly improved by becoming the Queen of France. I’m enjoying this era of French history very much. Thanks for this, Susan! It’s a fascinating story I’d not heard before. One question, though. Why was Louis so desperate to marry Charlotte? Was it a particularly good dynastic marriage? Or did she look like she would grow up to be a beauty? Hi Caecilia, There were a few reasons for the marriage. Charlotte’s father was an ally of Louis and he was always looking to expand his territory. Considering his scheming personality he might have thought he could somehow get the territory of Savoy. I wouldn’t put it past Louis to marry her just to irritate is father too! And also, Louis knew it was his duty to have an heir but I don’t think he really cared who the mother was. By marrying a young girl, he delayed his marital duties by six years. Louis remains a complex and compelling character to me. It would be interesting to get a psychological profile of him. Thanks so much for reading! Charlotte was a very nice lady. Imagine married at 9 years old, the good part was that her husband wait until she was a little lady to have a marital life.